The chaos of purging, sorting, packing and moving across 4 states to Kansas is a memory. It seems a life time ago. that I was walking in the desert. 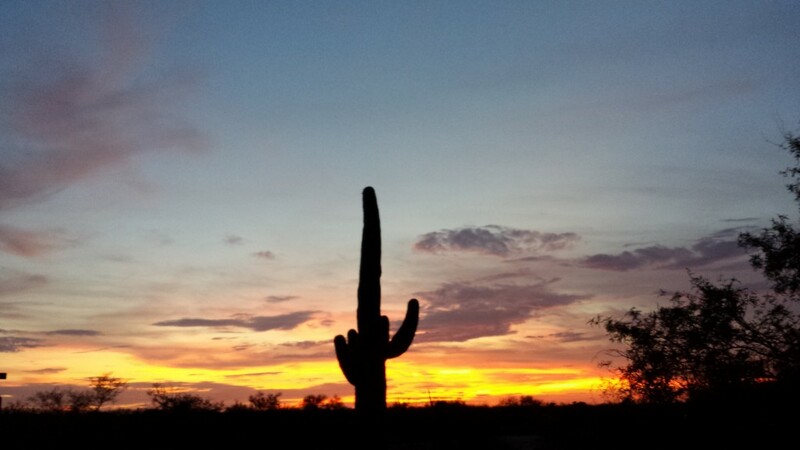 Only a little over 2 years ago my partner and I returned from Florida to Tucson. I was convinced then hat I was called back to the desert. I felt that call most while I was at the Redemtorist Renewal Center, Hosea 2:14 spoke to me and I listened, “So now I am going to draw her back to me. I will lead her into the desert. There I will speak tenderly to her. 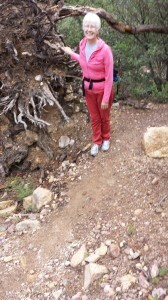 ” While taking a course in Spiritual Direction at the Hesychia School for Spiritual Direction, I came to love the desert even more. 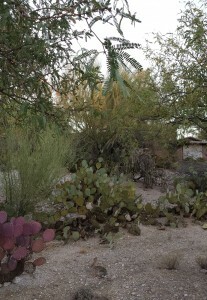 The desert spoke to me in gentle comforting sounds, through bunnies standing still for me to take their picture, quails, calling to each other, coyotes sauntering across the road, brilliant bird of paradise plants swaying in the breeze and stunning sunsets and sunrises gave endless delight on my walks. The last week before my move, I experienced the most enchanting sights. 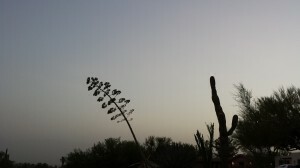 I was dazzled by the Century plant on a very rare misty morning on a sunrise walk. Those of you living in this area of Tucson, know that the mountains are nearly always visible. But on this amazing morning, they were whited out not by dust but a mist. During my last week of working at a night job, I beheld this amazing sunset. I bid farewell with Rev. 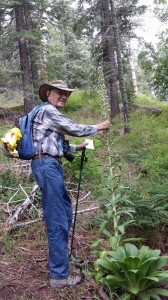 Frank Rose who lead me on a nature hike to the beloved Mount Lemmon, where I first fell in love with Tucson. 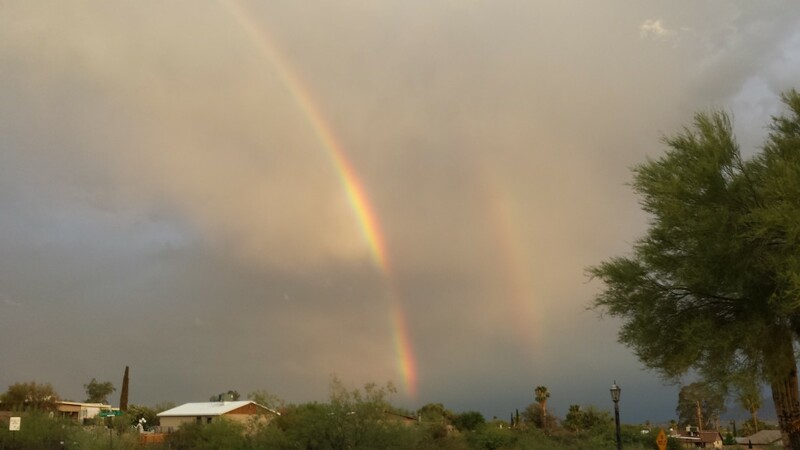 Rainbows have always delighted me but in Tucson we see them rarely except during the monsoon. A soft gentle rain was falling on one of my last sunrise walks. I went walking anyway looking towards the cloudy eastern horizon breathing in the scent familiar to desert dwellers exhaled by mesquites trees. I rounded a corner and saw it, a bright beautiful rainbow. Then, as I walked along taking pictures, there was another bow in the sky. 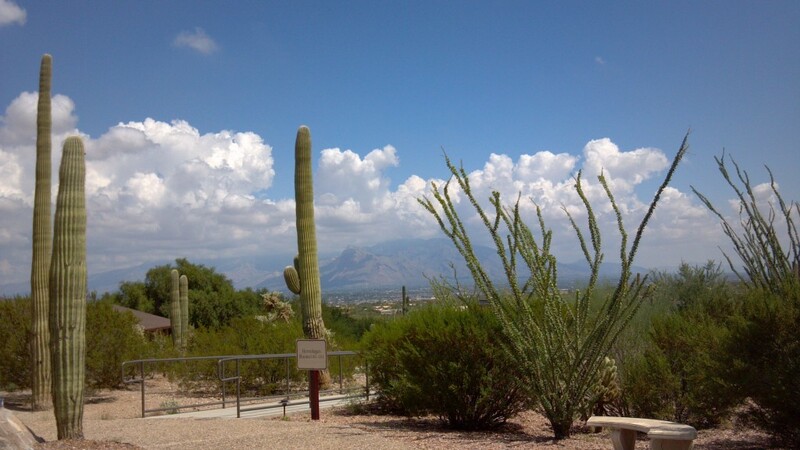 I was comforted by the sight of the rainbow and by these amazing sights during my last days in Tucson. Good wishes and hugs from friends and family gave me comfort but leaving familiar sights, places and friends behind is sad. New beginnings are exciting and full of promise but a sense of loss caught me many times. The trip to Kansas was tiring for both Danny and I, though he did the driving. I watched the scenes unroll before me. New sights delighted me. Driving through a NM shower, we saw a patch of bright rainbow ahead of us. A sign of hope and restoration. We saw magnificent view of mountains and cattle grazing in green fields, occasionally, deer alongside of the road. Thankfully, they stayed on the grassy side. Poet Kathleen Raine perfectly describes the way I felt. “Meaning moods the whole scale of our inner experience, finds in nature “the correspondences” through which we may know our boundless selves.” For Swedenborgians everywhere this strikes a familiar tone. As spiritual beings we’re always moving from one state to another. We may be moved in our spirit by the changes we experience with our physical senses. I was undergoing an internal shift, as we drove through the countryside. 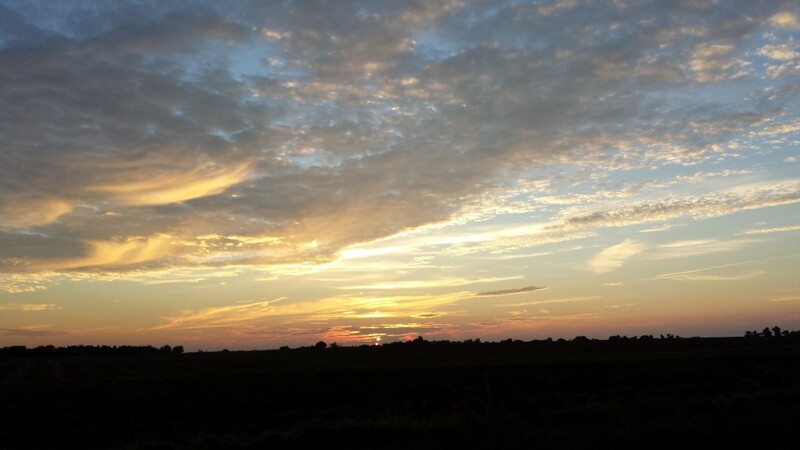 I was called to another place, to freshly plowed fields, wheat and corn fields. My attraction to natural phenomena is not at all unique. Recently, I found the word, biophilia describing a deeply rooted biological instinct for loving living things. This entry was posted in Uncategorized and tagged Century plant, Mount Lemmon, moving stresses, Pawnee Rock, Pretty Prairie, rainbows, Sunrise, Swedenborgian on August 7, 2014 by admin.